Active and Retired Military members looking for Pure Mountain Fun all season long can save money by purchasing a Military Season Pass. An active military ID (or equivalent) must be presented in order to pick up. This is an unrestricted pass with no blackout dates. Who can purchase the Military Season Pass? The Military Season Pass is for ACTIVE and RETIRED U.S. Military Personnel members only. Proof of eligibility must be provided. 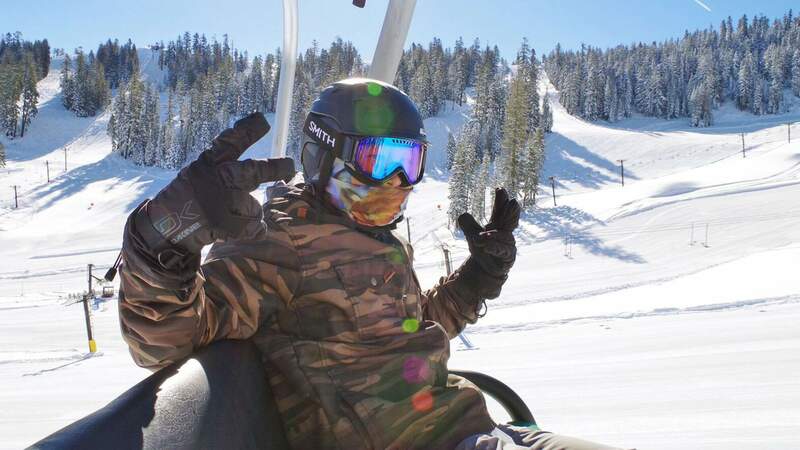 No, the Military Season Pass provides unlimited, unrestricted access to Bear Valley Mountain for the 18/19 Winter Season. Does it come with any discounts or perks? Military Season Passes DO NOT allow for Season Locker or Team discounts. Are there child or dependent pricing for the Military Pass? No. The Military Season Pass is only available for ACTIVE and RETIRED Military Personnel members only. There is one price for all ages. Proof of eligibility must be shown. What U.S. military branches are eligible for the Military Pass? Anyone currently serving in or retired from the U.S. Army and Army Reserve, Army National Guard, U.S. Navy and Navy Reserves, U.S. Air Force and Air Force Reserve, Air National Guard, Marine Corps and Marine Corps Reserve, Coast Guard and Coast Guard Reserve are eligible. How is ACTIVE & RETIRED Military Personnel Member defined? Active Duty (full-time): A person who is currently serving on active duty is in the military full-time (serving on Title 10 orders for 30 days or more). Retired: A military retiree is any former member of the uniformed services who is entitled, under statute, to retired, retirement, or retainer pay. Examples include, but are not necessarily limited to, spending 20 or more years in the military, or permanent retirement by reasons of physical disability. I purchased my pass online, how do I get my pass? On your first day at the mountain, stop by the guest services office to pick up your pass! If you did not upload a photo to your profile, a picture will be taken in the office. Make sure you bring proof of eligibility (ex. Military ID). If proof of eligibility is not provided, we will not be able to issue a Military Pass. What kind of proof do I need to bring? Are Military Season Passes refundable? What if I get deployed? The Military Season Pass is non-transferable and non-refundable. However, in the event you are deployed and you did not use your Military Season Pass at all - we will rollover the cost of your Military pass to the following season.